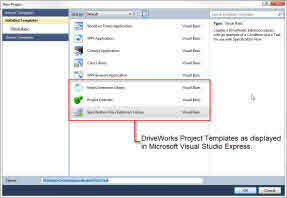 DriveWorks Pro has been built with a fully documented Application Programming Interface (API) allowing you to create your own plugin to DriveWorks using Visual Studio or Visual Studio Express. To get you started programming with the DriveWorks API we have created a Software Development Kit (SDK) that includes the reference assemblies that you will need, the complete documentation as well as some Visual Studio Project Templates. To obtain the SDK please send an email request to apisupport@driveworks.co.uk. The SDK is made freely available to all customers with a valid subscription contract. Project Extender - Adds functionality to a DriveWorks project. Extension Library - Enables DriveWorks to be extended in many ways. The table below details some common uses of extensibility in DriveWorks. What DriveWorks extensibility concepts apply? Create a Macro, e.g. to load some data from a text file into a running specification. Project Extender It's also worth looking into Specification Macros, these often mean that you don't need to create an actual macro in code. You can also increase the capabilities available to Specification Macros by creating a Specification Flow Task in an Extension Library. Create a plugin to Listen for Model Generation Events, to interact with the model generation process, e.g. to implement a PDM plugin, or do some sort of post processing. Extension Library It is also possible to create SOLIDWORKS and Document macros which are called by DriveWorks during generation at certain points during the generation process. Create a plugin to Listen for Specification Events, to interact with the specification process, e.g. to implement a PDM plugin, or do things at certain events during a specification. Extension Library It is also possible to create SOLIDWORKS and Document macros which are called by DriveWorks during generation at certain points during the generation process. Something Else... Extension Library If you're doing anything that isn't a macro or function, you probably want an extension library.